I did it! I finished the 5K without walking or stopping, and without any new ankle damage. The background in this picture looks fake, doesn’t it? It’s not – it was an absolutely perfect morning for a run through Boston. My chauffeur – also known as my dad – even wore the Run for Dana-Farber hat I got with my packet but probably wouldn’t wear myself. And he was on the sidelines just before the finish line to give me a high-five. Thanks Dad! All-in-all, I raised $1,051 and earned myself that awesome patch you see above my number. It means I’m a Pacesetter, having raised $1,000 or more. Our team raised more than $33,000 total and I’m wicked proud to have been part of it. 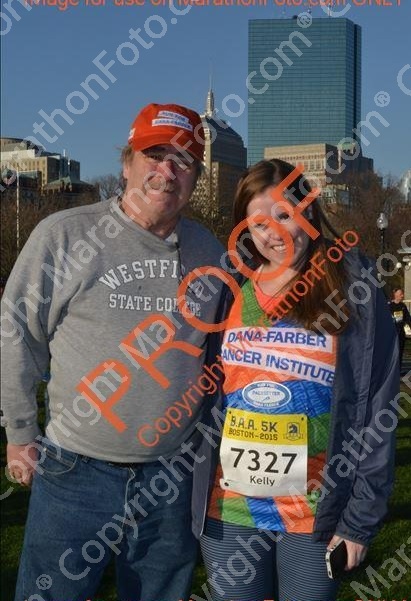 Like last year, people were saying, “Yeah Dana-Farber!” and “Thank you, Dana-Farber!” as I ran by and it was so inspiring. I ran the first 2 miles with my boss Molly, but I got really excited for the last mile and took off. My Garmin said I finished at exactly 32:00. Turns out my official time was 31:55 – a new personal best for me (I ran a 32:20 in July 2014)! I was trying to get under 30 but my ankle pain was nagging for the last half-mile and for some reason, they narrowed the last quarter-mile to one side of the street so even if you wanted to sprint the last quarter-mile, it was too congested. Oh well! I’m glad it was a good run for me, because it’ll be my last for a while. I was hoping I’d wake up today with no ankle pain – a sign that I don’t really need to take any time off from running. Unfortunately, that wasn’t the case. Twisting hurts more than usual today, and it’s just very achy. I decided to take it easy and do some yardwork, cleaning and baking, in addition to my PT exercises/stretches. Tomorrow I’ll get back in the saddle as far as workouts, but no running. Thank you again to everyone who donated. If you didn’t get around to it or weren’t sure I’d run the race, you can still make a donation for a few more weeks. I promise not to bug you for money again until next year. On Monday, my best friend in the whole world, Juls, put me at $1,001! A little while later, my cousin Gary and his wife Lauren got me even further. And then there’s still a check from my Uncle Larry somewhere in the process of being cashed and added to my total, so I’m actually at $1,051. As for running, I’ve gone on a couple of good runs, plus one miserably painful run, but I’m pumped and ready to go. Saturday morning will be interesting as I’m still living in western Mass. I get up at 4 to drive to work every morning, so doing it Saturday won’t be any different, but I don’t go running as soon as I get to the city on weekdays. The good thing is I can still park in Brighton, take a little nap on the T, and hopefully still get to the Common plenty early for the 8 a.m. race. We have a team photo at 7, and that’s when I’ll get my Pacesetter patch to wear! I woke up yesterday with the worst fear that my eye issues were back – my right eye would not stop watering and seemed to be bulging. I’m hyper-aware of even the slightest changes to my eyes since the surgeries, but it turns out this is just either really bad allergies for the first time this year, or a sinus infection. As the day went on, everything got worse. I was burning up in a sleeveless dress, bare legs and open-toe shoes (it was only 65 outside), my head hurt, my eyes wouldn’t stop watering and I couldn’t stop sneezing. And I was more tired than I’ve felt in weeks, despite sleeping well lately. On the bus home, I actually fell asleep for a solid 10 minutes of the 20-minute ride. Driving home 1.5 hours was rough – I had to talk to myself and blast the music to keep myself awake. By this point, my head was throbbing in pain. I got home, ate a takeout dinner, and went to bed. I woke up this morning feeling the same, but armed with Claritin thanks to my brother. Hopefully it’s just allergies and the Claritin helps. I also got some kind of disappointing news yesterday at physical therapy (which was just so much fun feeling sick). Saturday will be my last run for a while. My ankle still isn’t healing, and the pain during certain stretches/exercises is almost unbearable. So, I’m allowed to race on Saturday and then I need to take at least 2-3 weeks off. I can still do my plyo workouts, but for cardio, I’ve got to stick to biking or something with less impact than running. Boo! I’m almost 2/3 of the way to my fundraising goal, with just over two weeks left until race day. Thanks to my generous friends and family, I’ve met the fundraising requirement, but I set a personal goal of $1,000 for myself and am determined to make it there. My online fundraising page only shows $611 but my uncle mailed in a $25 check as well. 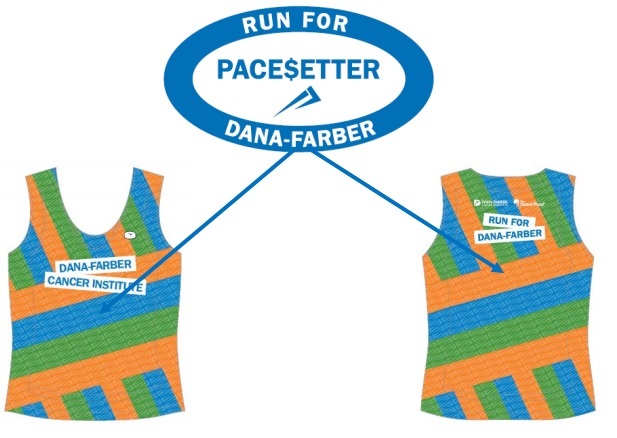 If I reach the $1,000 mark before the race, I get to wear a nifty patch on my singlet indicating I’m a “pacesetter.” Help me get there – donate today! Not only did I finally log 2 miles today, I ran for 10 minutes straight. Twice! I’m not sure if it’s confidence from being told I am allowed to run or rebellion from being told to take it easy, but it felt good to run. I haven’t been able to run for more than a few minutes at a time in months. I ran for 10, walked for 4 (which hurt WAY more than running), then ran for another 10. Then I did my homework – the exercises the physical therapist gave me to do at home. It consists of calf raises, toe raises, balancing on one leg, squats, and bridges. Let me tell you – balancing on one leg has never been so painful. 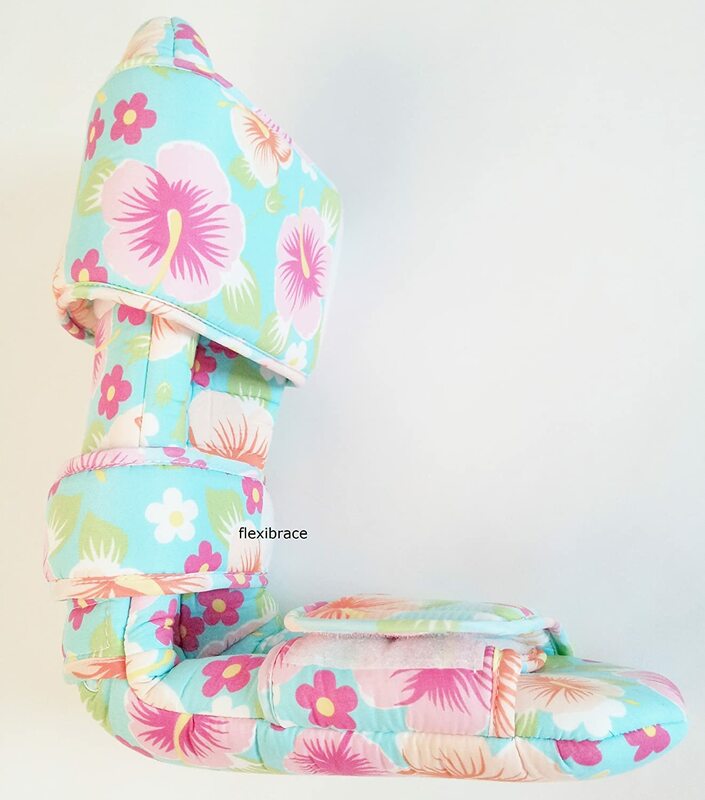 It keeps your ankle at a 90-degree angle while you sleep, which is usually best for people with plantar fasciitis (I have that, too) but especially good for me right now because I point my toes in my sleep. I do it mostly because my ankles are so shot and weak and it hasn’t bothered me until now – because pointing my toes hurts my left ankle SO bad. I’ll definitely take a selfie once it arrives tomorrow. Let’s be honest – I’m a nerd. I love listening to NPR during my long commutes. On Monday’s Morning Edition, there was a piece on compression clothing. As you know from reading this blog, I swear by my Zensah shin sleeves. The takeaway I got was this – compression sleeves actually did little (in the small study) to improve performance, but does actually help with post-workout swelling. But my doctor and my past and current physical therapists have both said they will help ME with MY shin splints, much like kinesio tape does. To each his own!